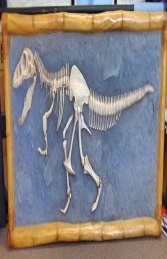 This T Rex Skeleton wall mounted in bamboo frame looks like it has just been unearthed from a cave wall it would look fantastic dotted around the walls of your Jurassic display, or for using as an educational learning tool. This wall-mounted T Rex Skeleton head wall mounted in a bamboo frame, which is ideal to use as a finishing touch in a pre-historic themed child's bedroom, museums, leisure parks, attractions and theme parks. This item is easy to attach to a wall or display area. Why not pair this item with the Dino skeleton head wall mounted (JR FSC1266), or with one of our 1ft, 2ft and 3ft Raptor models.